The wind was wiping at me, pushing me, trying to unseat me. I could smell the moisture in the air as it started to rain for a brief moment. Then the wind lashed out with a vengeance and almost blew me right off my horse. It was a windy day by Icelandic standards which meant for me, it felt like I was in a hurricane. But I was enjoying every second of it because I was living out one of my dreams: to ride an Icelandic Horse in Iceland. Riding Icelandic Horses across moss covered lava fields. It was my final day on a 12 day trip to the land of Fire and Ice and I had saved the best for last. 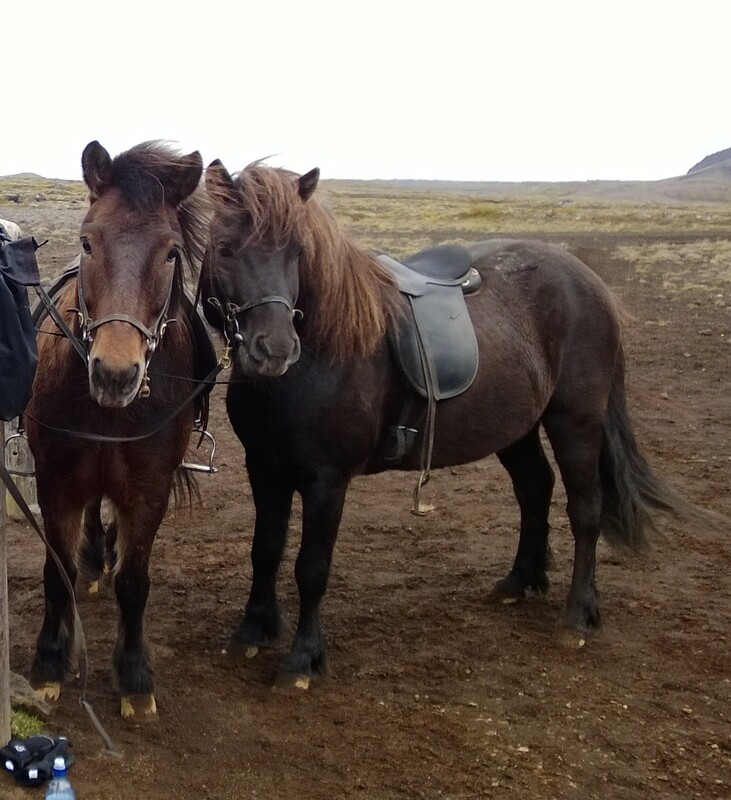 As an avid horseback rider back home in Canada, experiencing the Icelandic Horse was a must. With their wild mane, short, compact stature, and solid sturdy legs, these horses were made for this land. They are considered to be the purest breeds of horse in the world, left untouched after the Vikings brought them to Iceland when they settled there over 1000 years ago. Since this time the bred has been allowed to develop and evolve into today’s Icelandic Horse: a sturdy, sure-footed, hardy bred that can withstand the harsh weather and living conditions, and navigate the difficult volcanic terrain of this island nation. Iceland has strict laws (that have been in place for hundreds of years) when it comes to their horses: no other bred is allowed on the island and once an Icelandic horse leaves it may never return. Having been isolated for centuries, these horses do not have the immune system to battle certain diseases that other horses do. Large heards of Icelandic Horses can be seen throughout Iceland. As the Icelandic horse evolved, they developed 5 gaits, something which only few breeds in the world have. Along with the typical walk, trot, canter/gallop that all horses have, the Icelandic can also do a “flying pace” (usually reserved for racing over short distances) and perform a 5th gait called the “tolt”. As smooth as the walk, with much the same leg motion, but as fast as the trot and sometimes, the canter, the tolt evolved as an alternative and easier way for the horse and rider to cover long distances. And this was what I was here to experience. After arriving at the stable, I was paired up with a beautiful chestnut mare named Phoenix, based on my riding ability and my desire to try the tolt. I was told Phoenix had a beautiful tolt and lots of energy. As we set out the sun was still shinning, but the wind was picking up and dark grey threatening clouds could be seen in the distance. Our small group of 4 began the ride by traveling across emerald green, moss covered lava fields as we headed for Mt Helgafeld in Heidmork Nature Park. Since the footing was good, we broke into a tolt right away and what an experience! It was so smooth, I felt that I could have been having a cup of tea as we raced along. My seat never left the saddle and it felt as gentle as the motion of a rocking chair. Our horses vied for the position of leader, with my little mare leading the way. As we slowed to a walk and entered the Nature Park, the scenery changed. Green moss gave way to bare volcanic rock that resembled a Martian-like landscape. The terrain was rough and rocky, then sometimes bare rock or volcanic sand. Riding across the volcanic terrain. As we rounded the backside of the volcano the wind continued to pick up until the weather seemed to reach a crescendo. I was acting as a sail on top of my horse and when that gush of wind grabbed me, it was all I could do to hold on. After that I ducked down onto Phoenix’s neck so she could do her job without interference from me. As I ducked and held on, I saw my sturdy little mare, head into the wind, mane wiping to the side and her sure footed hooves, expertly navigating the uneven, volcanic terrain. She belonged to this land, this was her home and she knew it well. She took care of me and gave me an experience I’ll never forget.